HK Instruments’ multifunctional measuring devices are used as a part of demand-controlled ventilation. Ventilation is boosted when a large number of people are in the building. Ventilation solutions of this type are needed in schools, offices, sports halls and hotels – that is, in all locations where it is important to maintain good air quality, even if utilisation rates vary greatly. In addition to ensuring good air quality, demand-controlled ventilation reduces energy consumption in buildings. As a result of technical innovations, our devices are even more versatile than before. CDT2000-DC, a CO2 transmitter using Dual Channel technology, is maintenance-free and can also be used in hospitals, nursing homes and other environments that would be challenging for ordinary CO2 transmitters. The large display on a CDT device is informative and easy to read, which also creates added value for the users of the building. RHT (3) and CDT (2) monitor the air quality in individual rooms and communicate any needs for added capacity to the building management system. 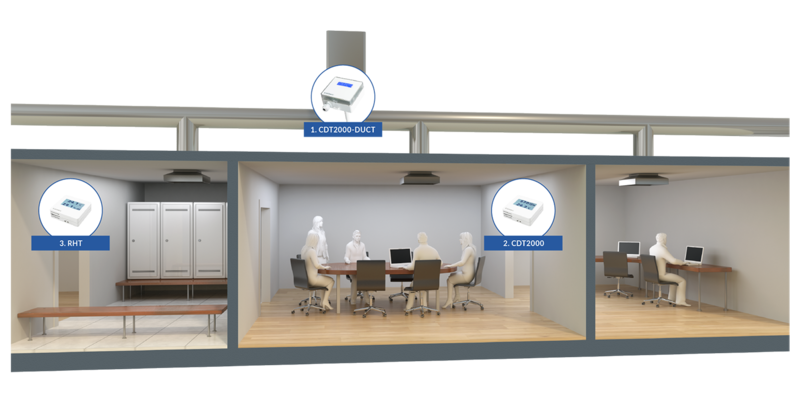 CDT2000 duct (1) monitors the extracted air across the area, enabling demand-controlled ventilation in the entire office.